Includes booklet stapled inside of it's Gatefold cover. Variation in label : "Mfd. By Apple Records, Inc" in rim text Side 1 label. No mention of "Mfd by Capitol Records" on Side 2 label. Release with 24 page booklet stapled inside of sleeve. Vinyl is shiny with several very light scuffs. Cover has light wear, includes booklet intact. 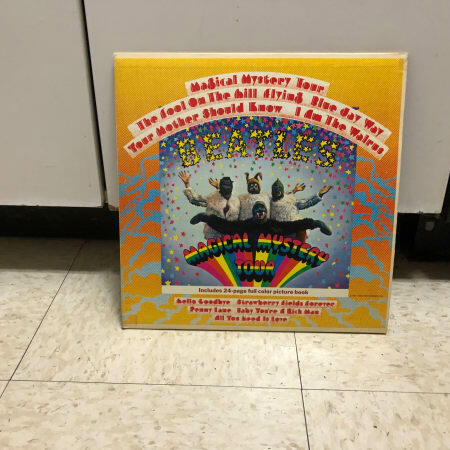 This is the Apple Records labeled Capitol release of MMT, issued in the early '70's. The runout says 2-2835-H-31 on Side 2 and 1-2835-B-28. Media looks NEW, as if just pressed. The sleeve is NEAR MINT to EXCELLENT, no marks or major problems, one corner has some scuffing, some edges have clear cellophane tape over the spine and on corners or edges to keep them from splitting, some tape has lifted off the sleeve. Vinyl in nice shape with only light bg noise in quietest sections. Audible click at start of side B. Cover in nice shape with minor scuffs and discoloration. Edge wear on front gatefold. Back gatefold has about 4" split at top and full split on bottom. Booklet in nice shape. Pages 19-22 have a tiny (~1/16") tear at bottom. There's a ~1/2" scuff on side A label.